OXFORD, Miss. 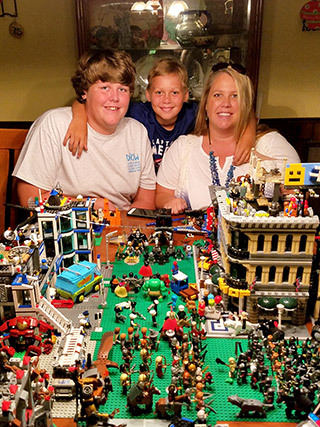 – Putting together 1,000-piece Lego displays is a regular occurrence at the home of Christie Rogers. Her dining room table is home to Harry Potter’s Hogwarts, an entire cityscape with three-story buildings, a police station, Avengers characters and Scooby-Doo’s Mystery Machine. “The feeling of accomplishment you get when you’ve struggled, tried every possible solution and finally get the right fit; that’s why I love building projects with Legos,” Rogers said. Rogers began working a different type of puzzle this month as she steps into her new role as an academic counselor for the University of Mississippi’s Bachelor of General Studies program. “I’m excited to help students put together the pieces of their academic journey,” Rogers said. “I hope I can help them set goals and make plans for their future. Originally from Martin, Tennessee, Rogers completed her bachelor’s degree in psychology at the University of Tennessee at Martin, and went on to complete her master’s degree in community counseling there in 1997. In 1994 she began her first job in the higher education field with the office of UT-Martin’s associate vice chancellor for student affairs and affirmative action. There, Rogers was able to advise students and also work with university entities to make sure programs and classes were compliant to American Disability Act standards. In 1998, she and her husband, Don Rogers, moved to Cape Girardeau, Missouri, and both began working for Southeast Missouri State University. She became the academic coordinator at the Sikeston Area Higher Education Center, a partnership between Southeast and Three Rivers Community College. In July 2001, the couple moved to Oxford when Don accepted a position as a residence hall area coordinator with Ole Miss. The family later moved to faculty housing at Northgate Hall when their second child, Currie, was born in 2004. Rogers said that for Christmas and birthdays, her two children begged for new Lego sets. From 2007 to 2012, Rogers worked as a 4-year-old preschool teacher at Oxford-University Methodist Church. She then transitioned to a teaching assistant and office staff member at Bramlett Elementary within the Oxford School District. Within just a few weeks of Rogers starting, her impact on students was apparent, said Terry Blackmarr, the BGS program’s assistant to the dean. Rogers said that when she saw the position open within the BGS program, she thought it seemed like a very interesting degree with potential for great student success stories. “I liked that this degree was not a cookie-cutter program,” she said. “It made room for individuality. I have seen people making some really creative choices in order to gain the knowledge they need to do something special with their career. Rogers’ experience in advising and counseling has reinforced her love for students and academic advising, Blackmarr said. “She develops an instant rapport with everyone she meets,” she said. Rogers will continue getting to know UM students this fall as she advises some of the 350 BGS majors on the Oxford campus. “Priorities do change, and people change their minds about their career,” Rogers said. “A degree like this is perfect for today’s generation who want to be individuals and want to choose their own path. The BGS academic program is found within UM’s Division of Outreach and Continuing Education. For more information, visit https://www.olemiss.edu/generalstudies.